With this in mind I have designed this 16" necklace.Using multi faceted jet black 4mm swarovski beads which really catch the light. 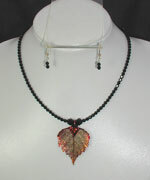 To compliment the swarovski beads I have added a beautiful and unique focal point of a real birch leaf. This 2" leaf has been coated with 24k gold and copper metal making it very strong.The coating gives the leaf a fire like quality but does not lose any detail. This necklace encompasses 2 key trends of black and metallics making it a perfect accessory for this seasons wardrobe. To complete the look you will also receive drop earrings made of gold filled (hard wearing) ear wires and black swarovski beads.